On the other hand, there is a condition called water intoxication, also known as water poisoning or dilutional hyponatremia. Essentially, if one drinks too much water, it causes a sudden imbalance between water and sodium (along with other cations) which leads to unconsciousness and even death. But again, there’s a point in between the amount of water in a few glasses and the amount of water to cause water poisoning – the toxic dose. But it’s more complicated than that. Some people have genetic or other adaptation to various compounds in the environment. Some toxic compounds can accumulate (although by doing so, there is some bio-availability of said compounds, which could eventually be toxic). Moreover, many compounds don’t stick around for a long period of time, being quickly cleared out of the blood through the kidneys. Back to the dose makes the poison. One of the most important aspects of toxicity is that the size of the organism consuming the substance is critical. That’s why the toxic dose is almost always expressed as mg/kg weight (it also can be expressed in a volume amount for a liquid or gas per kg weight). So a fixed amount of a compound may be toxic to a 10 kg child, and safe to a 100 kg man, because the man can tolerate 10X more of the compound. Finally, and most importantly, toxicity does not necessarily mean death. A toxic dose may cause minor effects like bleeding or headache, or it could cause something more serious like depression or a coronary event – of course, some dose might cause death (like water poisoning can). Dose-response relationships are amongst the earliest studies done on any new drug, pesticide, and many chemicals. Cancer drugs require highly advanced statistical analyses of dose-response, because sometimes the best dose for efficacy is just below the toxic level dose. This is because cancer cells are really just corrupted versions of your own cells, so what kills them probably kills “normal” cells. As you can see above, two curves are generated, the blue one measures the efficacy and the red one, the toxicity. 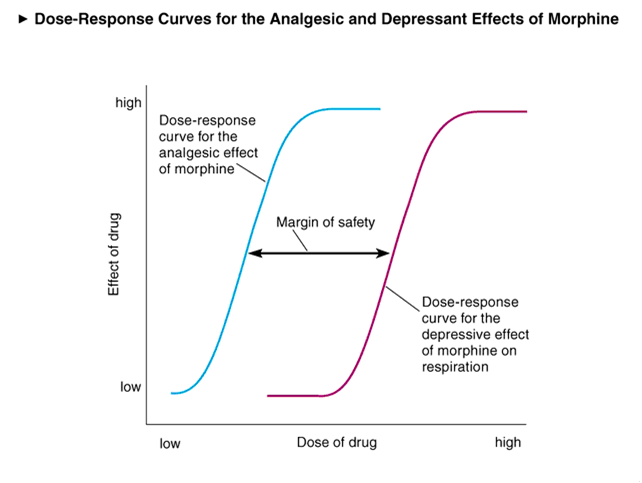 One can then determine how much of margin of safety there might be between the effective dose and a toxic dose. This matters in biology. One of the most important issues in determining whether a pharmaceutical or agricultural pesticide should or should not be on the market is examining not only the toxicity but also the efficacy. For many, DDT is considered to be one of the big “science” mistakes of history. DDT was used extensively during World War II by the Allies, in both the Pacific and Europe, to control the insect vectors of typhus, dengue fever and malaria, nearly eliminating the disease in Europe. DDT was spectacularly successful in eradicating these diseases in Australia, the South Pacific, South America and other areas of the world after WWII. In fact, DDT has eliminated malaria in the USA. Yes, the United States used to have a serious problem with malaria, something that is rarely remembered. In 1947, malaria was endemic to wide sections of the USA, mostly in the south, Mississippi Valley and California’s Central Valley. Within 5 years, through draining wetlands and widespread use of DDT, malaria was nearly eliminated in the USA. In the 1920’s, there were thousands of outbreaks of malaria every year, with hundreds of deaths. Since 1963, there have been only 63 outbreaks of malaria, all as a result of one mosquito biting one person who carried the malaria parasite from an endemic area (South America, South Asia, or Africa). Here’s one infectious disease that was not prevented by vaccines, but it was stopped by DDT. By the early 1960’s, upon publication of Rachel Carson’s book, Silent Spring, which described some scientific, but mostly anecdotal evidence that DDT had harmful and long-lasting effects on the environment, the tide turned against DDT and it was mostly banned or strictly controlled by the late 1960’s. But if I look back in time, is there some margin of safety between the obvious deleterious effects on the environment compared to the thousands of lives saved from malaria? Maybe we used too much DDT and could have used it more safely, something we would do today. Of course, we also drained a massive number of wetlands, also an environmental disaster, to stop this disease. But eliminating a dangerous disease that harms or kills? That should take priority. Monsanto has developed genetically modified (GMO) grains that are resistant to glyphosate, so that agriculture can apply the herbicide to kill the competitive weeds while not harming the crop. This allows farmers to suppress the weeds while allowing better production out of the grain crop. And use a lot less Round Up. In fact, there is substantial evidence that GMO plus glyphosate corn crops provide higher yields under most conditions (especially when there are environmental stressors such as weather). So, there is some, relatively significant, positive effect from glyphosate use in producing more food. Productivity increases lead to both lower prices and more food for the world. Sounds good to me. And once again, the dose makes the poison. Maybe drinking a glass of Round Up would be insane, since that’s definitely far above the toxic dose for glyphosate. But glyphosate isn’t really that toxic, because according to the graphic from Dr. Cami Ryan above, the LD50 (the dose at which 50% of test organisms die) is 5600 mg/kg. A 100 kg human would need to consume 560,000 mg (or 1.23 pounds for barbarians who refuse to use the metric system), a thoroughly ridiculous amount of that chemical. EPA conducted a dietary risk assessment for glyphosate based on a worst-case risk scenario, that is, assuming that 100 percent of all possible commodities/acreage were treated, and assuming that tolerance-level residues remained in/on all treated commodities. The Agency concluded that the chronic dietary risk posed by glyphosate food uses is minimal. From their research, the EPA has determined that a maximum dose of about 2 mg/kg/day is very safe. So, let’s put this in some sort of simple math. Generally, a farmer uses less than 450 grams of glyphosate (that’s 16 ounces for barbarians) per acre of corn. An average acre of corn in the USA produces approximately 9000 ears of corn. If every bit of glyphosate just stays on ears of corn (and it doesn’t), each ear would have around 50 mg of glyphosate. A 100 kg human could tolerate up to 2000 mg of glyphosate per day, so this is far below the toxic dose. You could eat 40 ears of corn and still not be harmed (of course, depending on your size). And remember, the dose-response depends on time, so glyphosate is probably not accumulating, and you could eat 40 ears every day. Even if every microgram of glyphosate is on your ear a corn, even a 25 kg child could probably safely consume that fully contaminated (and not realistic) ear of corn. But here’s the simplest of simple math–glyphosate is not sprayed directly on the ears of corn. Glyphosate suppresses weeds, and would kill corn if sprayed directly. So the amount on that ear of corn is basically undetectable. So, the amount of glyphosate that you consume is almost nothing, but far below the 2 mg/kg/day limit that has been established as very conservatively safe. And mountains of research has shown that glyphosate and GMOs (often conflated in arguments) are safe at current environmental levels. As I thoroughly deconstructed previously, a review from the International Agency for Research on Cancer (IARC), recently published in Lancet Oncology, an extremely high impact factor journal, probably one of the most respected journals in cancer research, seemed to indicate that glyphosate causes cancer. And the IARC, one of the intergovernmental agencies within the World Health Organization, is widely respected for their research into the causes of cancer. According to the IARC, glyphosate was characterized as a Group 2A compound: Probably carcinogenic to humans. Oh no. Do you know what else is a carcinogen? A common chemical produced by fruits and your own body causes cancer – formaldehyde, the boogeyman of every antivaccine nut out there. According to the IARC, it’s a Group 1 carcinogen, meaning it’ll definitely cause a cancer. In other words, much more dangerous than glyphosate. And formaldehyde occurs naturally everywhere. It’s in apples, up to 22 ppm (parts per million). Maybe that old saying about an apple a day should be ended, because each apple (and many other fruits) have fairly high levels of formaldehyde, but still below what is considered dangerous. In other words, the dose response shows that the level of glyphosate consumed is far below what is considered even slightly dangerous, below the actual level to detect the first point on a dose-response curve. Just like glyphosate, there’s a world of myths about vaccine ingredients. But let’s boil it down to simple math, once again. And we’re going back to that “dangerous” chemical that contaminates our vaccines (and apparently our apples)–formaldehyde. This simple biochemical is used in the purification of the vaccine (the last thing we want is contamination from viruses or bacteria)– 99.9% of the formaldehyde is removed during the final steps of manufacturing. The package labeling of a typical vaccine does not include the amount of formaldehyde in the vaccines because it is so tiny, so minuscule, so veritably invisible, that the amount actually cannot be measured. 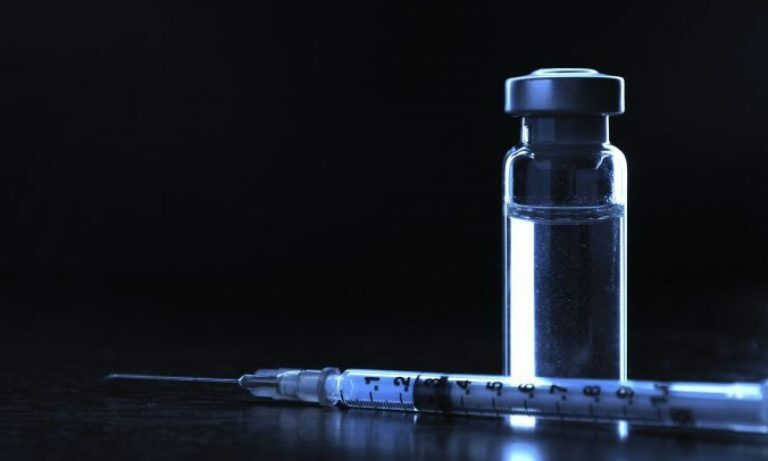 It’s possible that there is actually no formaldehyde in solution, because it cannot be measured, but the chances are good there is some because the manufacturing process can’t dilute out the vaccine sufficiently to guarantee that every picogram (that’s one trillionth of a gram) is removed, because it would dilute the vaccine’s antigen too. Now one might wonder how a child, even one that consumes nothing but “organic” foods (obviously glyphosate free) and has never been vaccinated, got 9 mg of formaldehyde floating in her blood. The body produces formaldehyde as a byproduct of metabolizing alcohols (not necessarily just from a beer, but the alcohol that is produced in the body and in other foods). And lots of foods contain formaldehyde, including fruits, nuts, and other yummy things. Apples have hundreds of thousands times more formaldehyde than one vaccine. But more than all of that, formaldehyde is filtered from the blood rather quickly (because animals evolved to remove it), and its half-life, that is the average time one-half of the molecules of formaldehyde stay in the blood, is around 1 minute. It does not accumulate, so even if you got that 10-20 million doses of vaccines, the tiny amount of formaldehyde injected would be gone in 1-2 minutes. It is simple math. The reference dose (that is the maximum daily dose over a lifetime that would be considered safe) for formaldehyde is around 0.2 mg/kg weight/day. An average child, let’s say 20 kg (about 48 lbs for the barbarians amongst us), could consume 4 mg of formaldehyde a day safely. Once again, about 1 million times more formaldehyde than in a single dose of vaccines. Let me keep repeating it – it’s all simple math. For any particular chemical on this planet, whether naturally occurring or manufacture by humans, there is some level, called a dose, at which it is toxic. Glyphosate levels on foods and in the environment are safe. Consumption of glyphosate in foods is far far below the level that is considered unsafe. Vaccine ingredients that sound scary are also far below the level that is considered toxic, sometimes by at least 6-7 orders of magnitude (slightly less simple math). Talbot AR, Shiaw MH, Huang JS, Yang SF, Goo TS, Wang SH, Chen CL, Sanford TR. Acute poisoning with a glyphosate-surfactant herbicide (‘Roundup’): a review of 93 cases. Hum Exp Toxicol. 1991 Jan;10(1):1-8. PubMed PMID: 1673618.